Readying a super high-profile device has its downsides, and Apple is on the receiving end of those. The upcoming iPhone 6 has been leaking all over the place as of late, and this trend is sure to intensify in the coming months, as we draw ever closer to September, when the Cupertino-based company is rumored to release its next flagship. Of course, it should be noted that it's been dummies of the iPhone 6 that have been leaking, and not actual, operational units, and today is no different. Regardless, this, on its own, is not reason enough to vehemently deny that this is how the new iPhone may end up looking. 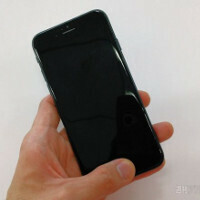 Indeed, what we have at hand this time around could prove to be an early, detailed look at the black, 4.7-inch iPhone 6. We've been over this several times before, so we won't waste your time with any further mumbo jumbo. Check out the photos, enjoy, and, of course, feel free to make the comment section below yours. Want the full iPhone 6 scoop? Check out our iPhone 6 rumor round-up. It definitely is better than the white/silver but I can't help but feel they're trying to skimp on build materials. I know margins are taking a hit but removing the jewelry affect might not be such a good idea. Apple's quest for margin is going to cheapen the jewelry affect - just like how it happened with the 5C(heap), which turned out to be a sales fail. Cheapen build materials how? This is just a dummy. With the exception of the two glass pieces at the back of the 5/5S, it looks like the build materials of the iPhone 6 will be pretty much the same. The back looks like it's still gonna be aluminium and the front will be glass. The design is looking like it might be a step down, the build materials not so much. Design a step down huh? I remember like yesterday when the iPhone 5 was leaking before launch. Everybody said it looked horrible with the two tone colors on the back. They also said it was the same old design as the iPhone 4/4s. Wait until you have a finished and polished model in your hands before you make that decision. I liked the original iPhone 4 and the black/slate iPhone 5 from the very beginning, so you're preaching to the choir. But in their defense, the original dummies were extremely ugly. HUGE bezels on the top, bottom, AND sides, gold fingerprint sensor on all models, etc. If the bezels were as big as the original pictures, I wouldn't waste my time waiting to hold a polished model. I still think this is a significant step-down because of all the antenna lines. Unless they decrease the size or make them less apparent, holding a finished iPhone 6 isn't going to make me enjoy the antenna lines any more or less. Based on the latest dummies, overall I think it's an ok to good-looking device, and I'm still looking forward to its release. Case manufacturers will sell a bunch of cases for the latest iToy. it looks better in black as the top and bottom bezels blend in with the screen. I like it in all black, looks great! Which is why the case manufacturers will be selling a lot of cases. Have to compensate for a reduced jewelry affect somehow. I strongly disagree with that. I thought the iPhone 5 design was terrible. Sharp, uncomfortable corners made out of a coated aluminum that chipped like crazy with huge bezels and an awful two-toned backed. That said, I think this design seen here is a huge improvement. Only negatives I have from the pictures are it looks way too thin and the bezels are still pretty large for 2014 (or 2013 even). It will likely be uncomfortable to hold being that thin. But, still seems much better than the iPhone 5. 4/4s design was miles better.. similar yes but alot better and sturdier. I know I'm in the minority but I prefer the iPhone 5c design, especially in white. It's also the most comfortable iPhone to hold and the plastic stands the test of time and keys in the pocket. I only wish they had a 64gb version. Its a sleeker looking device and yes curved back is a big + compared to the bulky edgy one. The 4/4s was better looking. Looks nice, now this is what I like. Unlike white/silver version. God that one was awful imo. Better than the current iPhone 5 horrid two-toned back. Remember when that leaked and everyone shouted it had to be fake because of how horrid that two-toned back looked? I honestly think the iPhone 5/5S is the best looking iPhone to date especially in space gray. These iPhone 6 leaks look horrible to me with the iPod touch body and thick antenna lines on the back. I'm just hoping these are all fakes and hoping Apple gives us another great looking phone. The black iPhones were the only good looking ones (other than the white 4/s) The rest were just ugly half whites including the white/silver 5/s and the Gold 5s. This iPhone 6 fixes the dual tone problem but now it is just an uglier design altogether. They'll make a huge deal about how it feels good in the hand and what not, but at that thickness, I really can't imagine it feels good to hold either. I think they totally dropped the ball with this one. If they continued the 5/5s look with a uniform color and maybe a continuous metal feel it would have looked great. Hey Dark. I have a question for you as a iphone user do you believe Ip6 its worthy? I stop using the iphone on the Iphone 4s. I currently have a note 3, and I change due to battery life. You are very savvy. If you were in my position will you go back to iphone? I'll be totally honest, I own the 5s, and note 3. Both are amazing, and I wouldn't change one for the other, cuz they both excel in what they do. I'd try the new iPhone, I'm not sure where you live, so look at you carriers buyers remorse period first. Try it and see, honestly you can't go wrong either way. Notes battery life is a lot better though. From all accounts the 6, running iOS 8, will be a major contender. Good luck bro. Still ugly with that home button, HTC stands out all the way through with its better design.